In snowy locales, a hard-working mudroom is a must have for keeping salt, slush, and wet gear at bay. For our homeowners in this snowy part of the country, being winter-ready means owning a variety of outerwear and boots to handle the fluctuations of the season – which can go from sub-zero temperatures to thaw conditions seemingly overnight. A well-designed mudroom gives homeowners a place to quickly grab the right coat or boot option to match the weather conditions. Living in the Chicago area you might need a full-length down parka one day and a light jacket the next, so most people have a pretty extensive outerwear wardrobe. Lots of hooks in a mudroom entry so homeowners can have the coats and jackets they wear most in sight and in easy reach is necessary. CL Design-Build also adds a closet for coats that aren’t in the regular rotation, but what’s nice is they’re all still in one place so you can quickly look at all your options. It also nice to have plenty of mudroom storage for winter outerwear is equally valuable in the off-season. Once it warms up, homeowners appreciate having a place to store their collection of cold-weather coats, footwear and accessories until they’re needed the next year. That’s why we design our mudrooms with extra storage, including a large closet where bulky winter gear can be packed away to make room for in-season items. 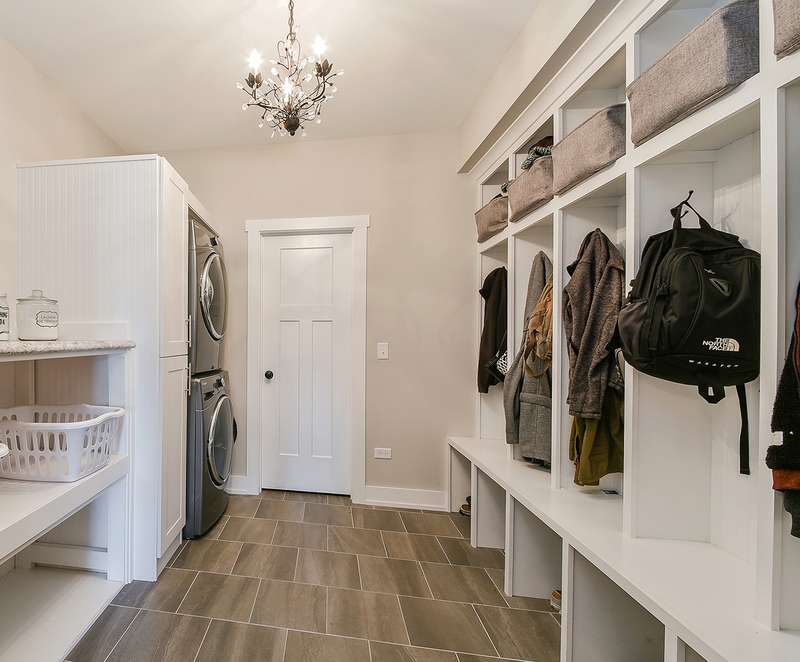 While we design our homes and mudrooms to fit the lifestyle of our clients, most of our Mudrooms are complete with individual cubbies as well as large closets. The mudroom ensures every hat, glove, flip flop and rain coat has a place no matter what the season. One of the greatest benefits of the mudroom for Midwesterners is the buffer zone, which is created from the outside world during winter weather. This space helps keep the main floors clean from what residents and their pets track in. With a well-placed mudroom, all of the slush, dirt and salt associated with snowy and wet weather stays in the mudroom, as opposed to being tracked throughout the house. This creates a space great for dropping off wet boots or collecting kids’ snow pants, and wiping pets’ paws after they’ve been out in the snow or mud. Another great option to consider is a heated floor, which helps warm those cold, wet boots. Of course there are so many options to personalize the designated mudroom space in our homes, and our expert designers are on hand to make sure the room meets the buyer’s specific needs and wants – from doggie zones to wet-clothes-only areas. During a snowy winter, boots, snow pants, hats, and gloves can become a daily uniform, and a mudroom serves the important purpose of “drop zone” for all extra outerwear. Nearly all of our homes feature an oversized mudroom off the garage, with plenty of space for individual cubbies for each member of the household, as well as bins and hooks to help with organization. Thinking about building your next home? Go to www.CLDesignBuild.com to get some ideas or email us at CLDesignBuild@aol.com to set up a complimentary meeting to discuss your ideas for your custom home.